This gorgeous 2 bedroom 2-bath condo is located at the Luxurious Sonoran Sun resort at Sandy beach. The Sonoran Sun is a beautiful complex with various amenities. It includes an on site restaurant with exquisite food. It has a fully equipped gym with the right equipment for you. This resort counts with 24-hour security where you can feel safe. It has a tennis court, spa, and a convenience store. Everything that you need will be found here. No need of going in to town. As you walk into this lovely condo on your right hand side you will find the laundry room with a washer machine and dryer for your use. As you continue to walk in you will find a modern fully equipped kitchen. You will find that it counts with a blender, coffeemaker, microwave, refrigerator and an oven stove. The cabinets are fully equipped with the essential items that are needed to prepare a delicious dinner. The kitchen has brown wooden cabinets and a granite counter. It has a counter bar with stools for a more casual and quick meal. The dinning table is a wooden round table that seats a total of 6 people for a great lunch or dinner. The living room has squishy sofas and a center coffee table. You have a beautiful view from the living room of the ocean, and the living room you have direct access to the balcony. In the living room you will have a TV with DVD, and VCR. The master room has a big comfy king size bed with a wooden frame and end tables, you will sleep like a baby. It has a huge double door closet with full-length mirrors. The room also has a large dresser for your clothes with TV. It also has direct access from the master room into the terrace. The Master bathroom has a double vanity sink with no need of sharing or waiting to brush your teeth, wash your face etc. There's a walk in shower with a commode. 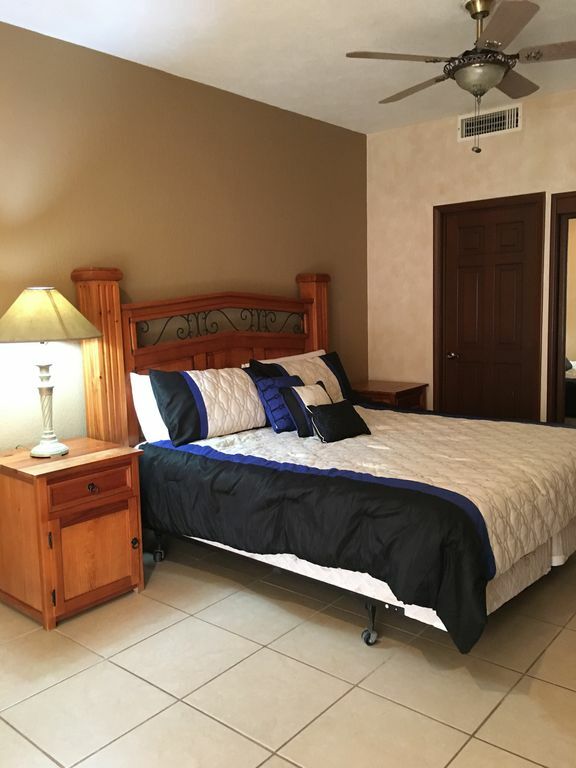 The 2nd bedroom has a queen size bed with bedside tables and dresser with a TV as well. It has a closet with full-length mirrors. The 2nd bathroom is down the hallway it counts with a single marble vanity sink with a walk in tub/shower and commode. The view from this floor is absolutely unbelievable. The terrace has a beautiful rectangular glass table with 6 chairs where your family and friends can enjoy a drink have a great conversation while your enjoying this breath taking view. We assure you that you will love it. What are you waiting for? Book this amazing unit now. I’ve been to Rocky Point many times. I have stayed at all 4 Sonoran Resorts and at the Sun many times. I am VERY unhappy with this room. It's the worst I've seen in any of the Sandy Beach resorts. SAFETY: There’s a nail that pokes out at waist height in the guest bedroom wall. It injured my daughter’s hand. I told the management. They did NOTHING. •	Bed linens are ratty. Batting pokes out from the comforter (stapled??? Really??? ), mattress pad is ripped. •	Serving utensils are seriously random. We were given 2 keys. One did NOT work. Maintenance guy (same one who couldn’t fix the blinds and did nothing about the nail) took me to the front desk. No replacement. We’ve had ONE key for FOUR people for three days. Not okay. At check in, there was ONE towel. We’ve gotten more. I went and bought the last two. But the key? Do I really have to go make my own copy? The keys don’t say “do not copy”, so in truth I could.